Vision is one of the main obstacle for most buyers of real estate. 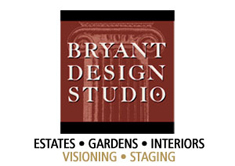 Bryant Design Studio offers services to assist in the process of buying or selling a property, by providing a buyer the visioning to see the potential of that property. Whether you are the buying agent, listing agent or property owner, we offer these at competitive rates and with a special “no cost” option. These services work whether the target property is a modest city home or a large country estate, especially when it comes to the most challenging of properties. Let Bryant Design Studio show the possibilities. - A grand villa with a great layout and details, but designed as a couples home with large rooms for entertaining. 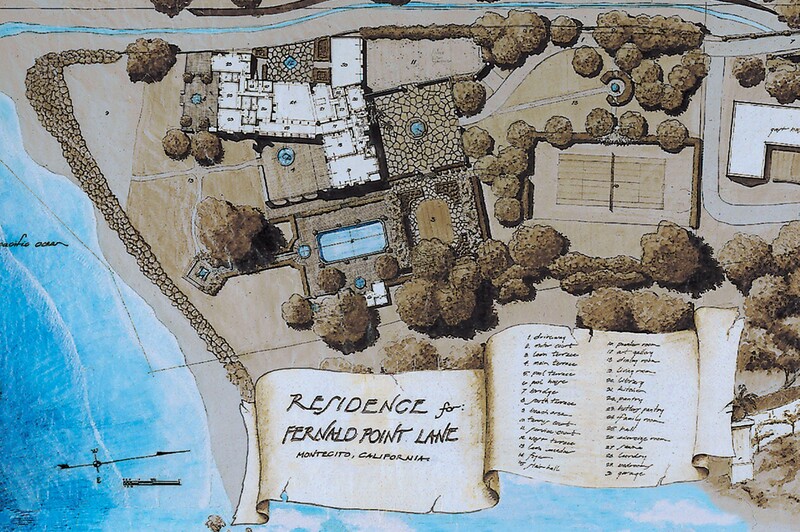 The villa didn’t have many amenities or extra spaces for guests or home office. 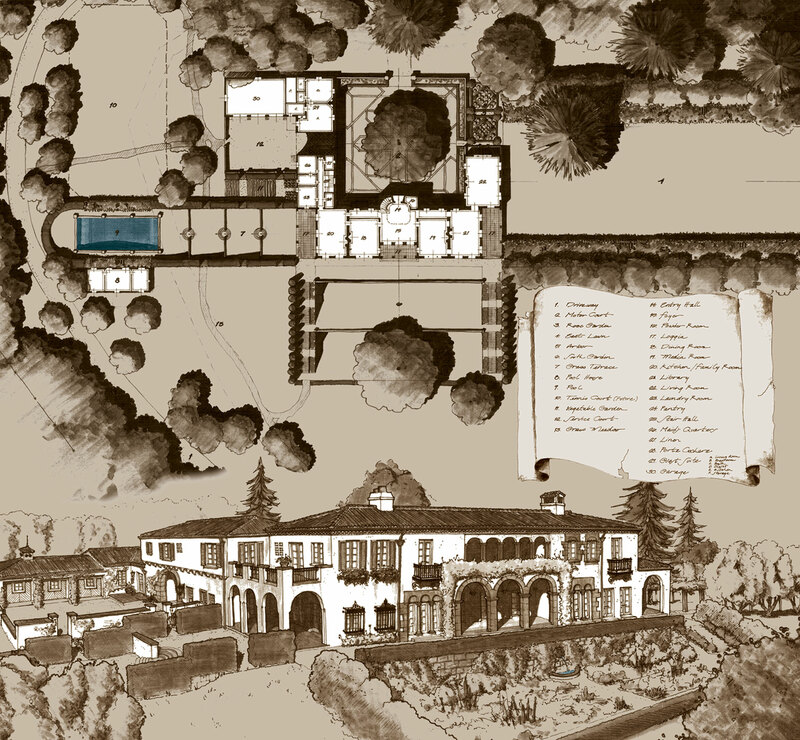 This drawing was implemented to show some of the spaces that could be added to mitigate those objections to the property. - A client looking for a property to build their dream home had some difficulties visualizing how a dream home might look like and fit on a prospective parcel. 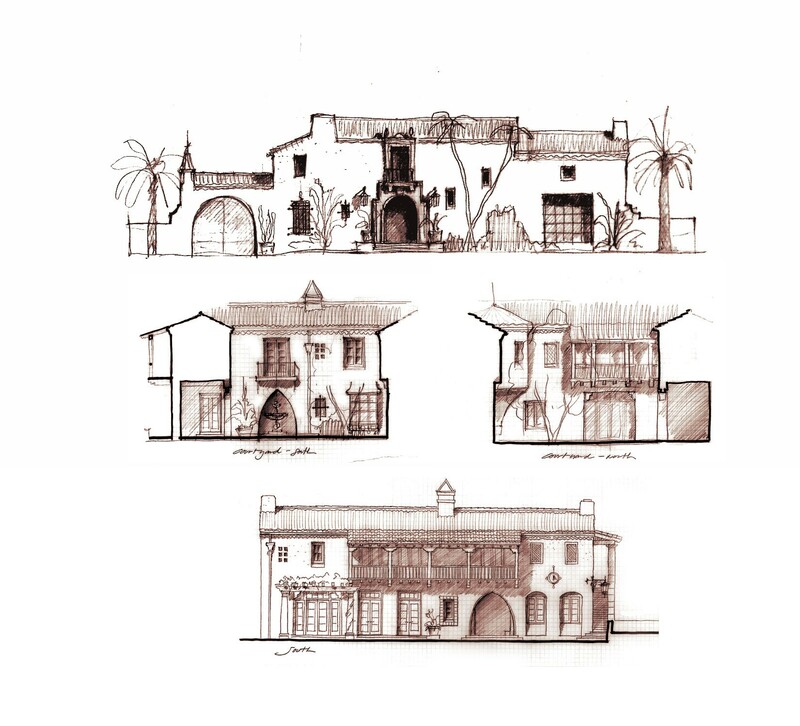 These thumbnail sketches along with several site sketches gave them the information to purchase and later build their dream house. - An existing dated 50’s ranch with potential. The buyer wanted to see if the ranch style could be into something that they might like, add a proper entry to the home & change the layout without loosing an awkwardly located pool. This rendering shows some of the changes to create a more desirable style and fixes the problem issues with the property without loosing too many of the existing assets. - A property owner, who listed a vacant parcel had several showings without an offer and was advised that the property was confusing as to what could be done with the property. 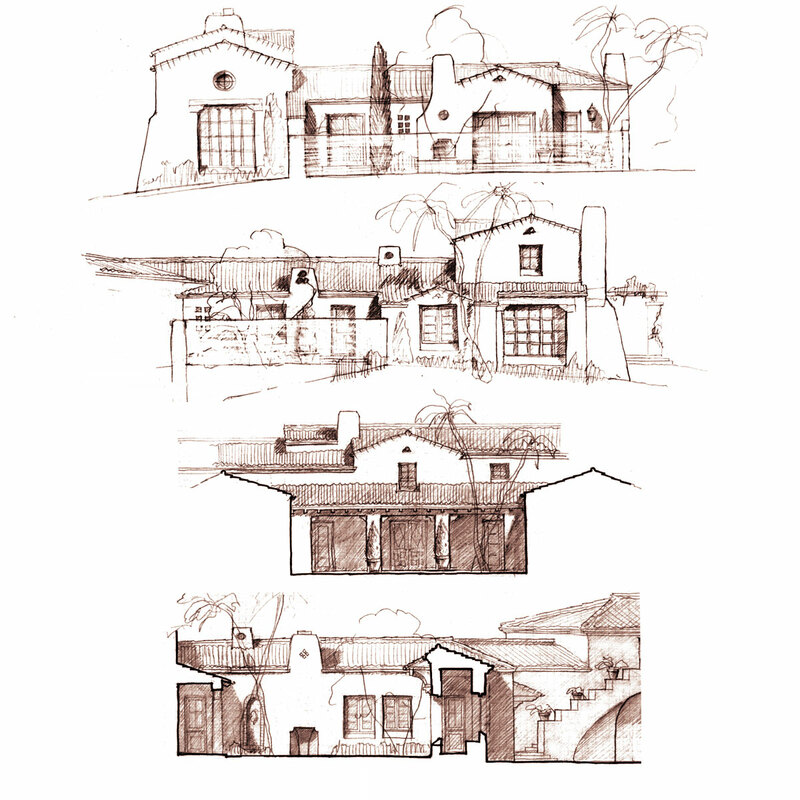 These elevations, along with a site plan, were generated to help with future showings. 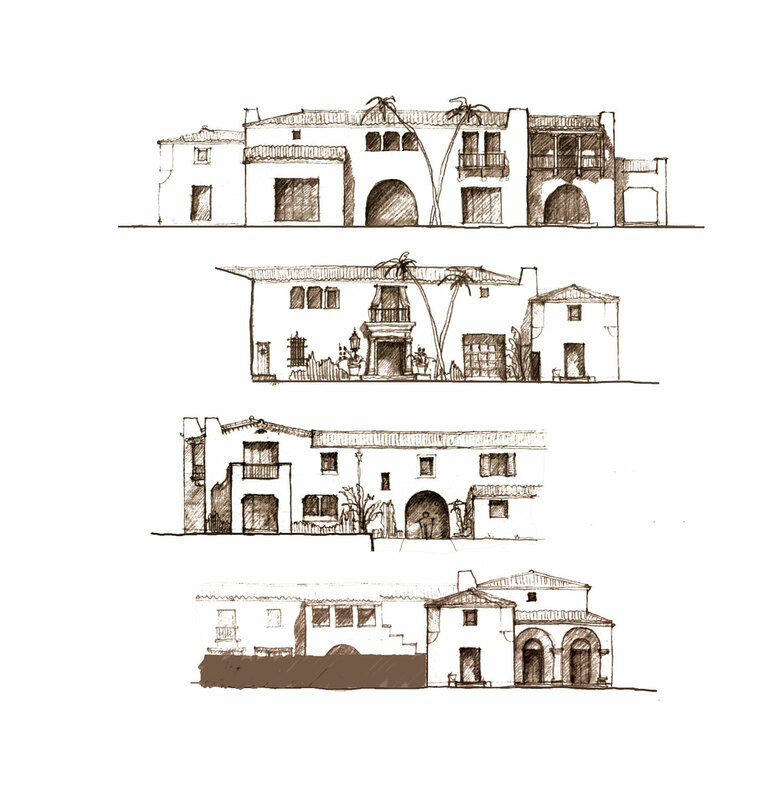 Later Italianate style Plans & elevations were also generated and the parcel sold. A major estate property with an old rundown mid-century ranch home with all the potential in the world. “What to do” with the old home was the question for the listing. Turn what was thought of as a drag on the value of the property into an asset. 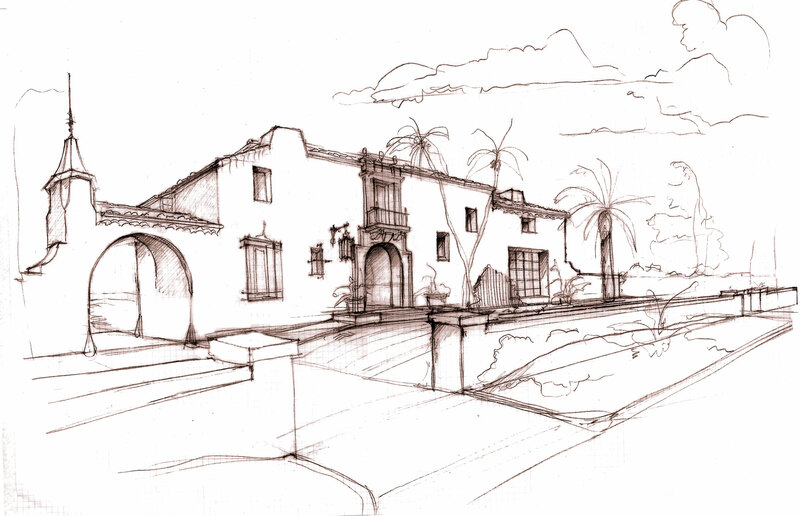 This was a drawing of a potential development of the existing home with a major remodel and change in entry. - A client looking at a particular property that was narrow, wanted to see if they could have the dream home they were looking for, which included a central courtyard and no Garages visible from the front. 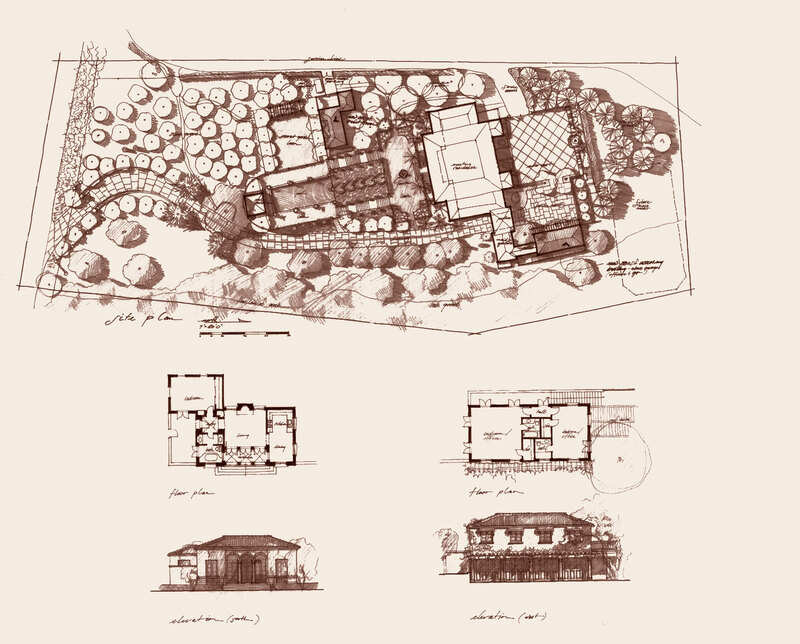 Thumbnail rendering, concept plan and several elevation & site sketches gave them the information to purchase and later build their dream house. - A client looking at a particular property that was narrow, wanted to see if they could have the dream home they were looking for, which included a central courtyard and no Garages visible from the front. 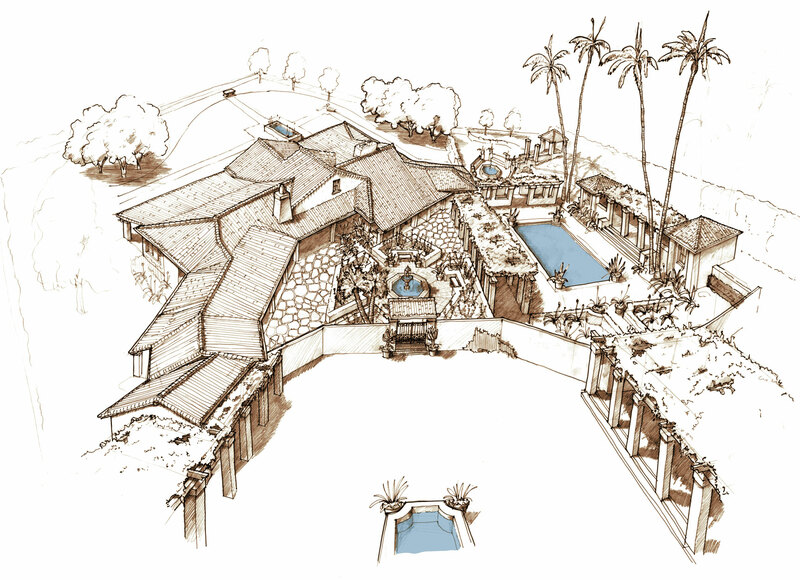 These thumbnail sketches, a rendering, concept plan and several site sketches gave them the information to purchase and later build their dream house. 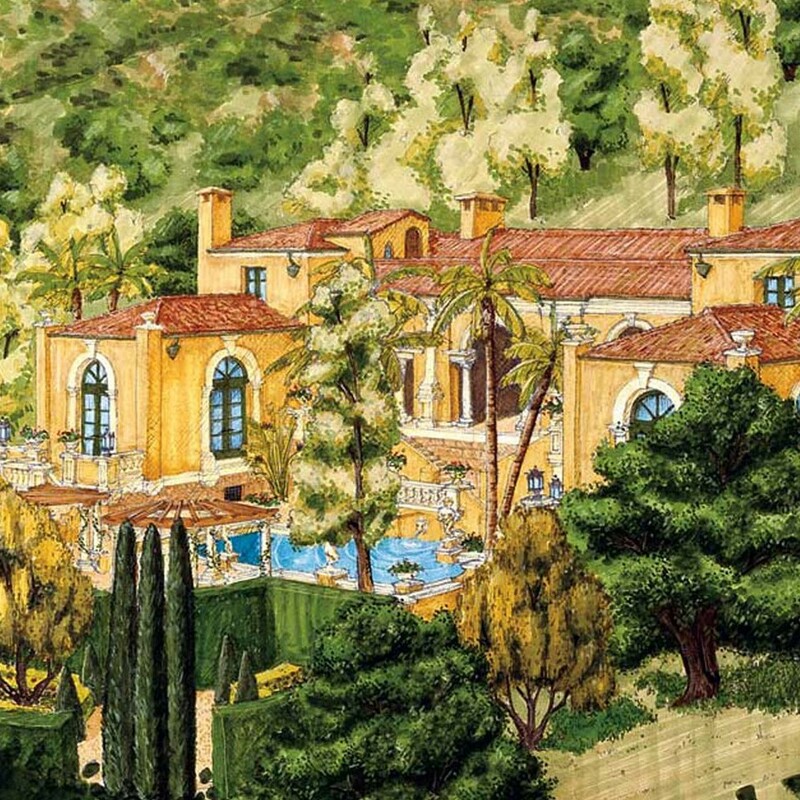 - A completely remodeled major estate listed for sale. 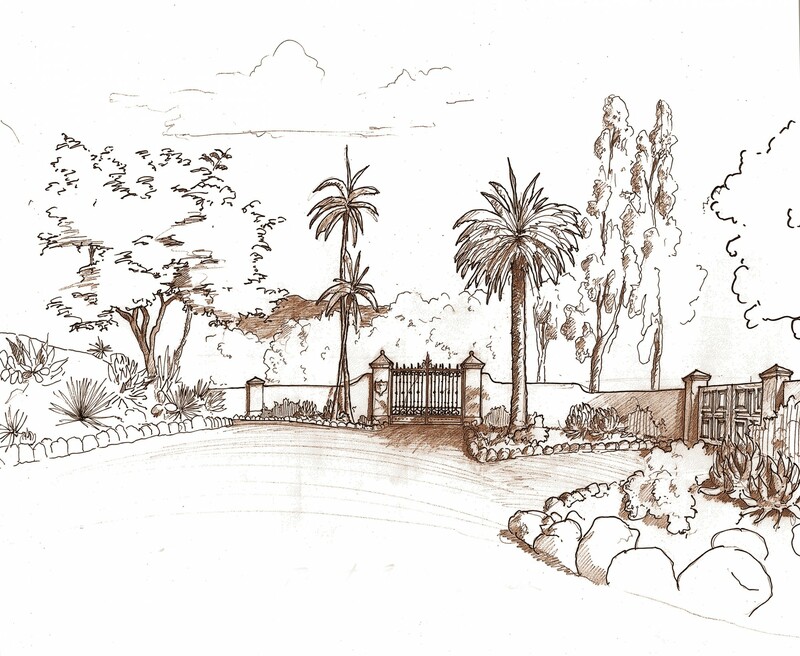 The one portion of the estate had been left to the Landscape Architect, being the front entry & service gates, was never thought though and was underwhelming to the finished estate. 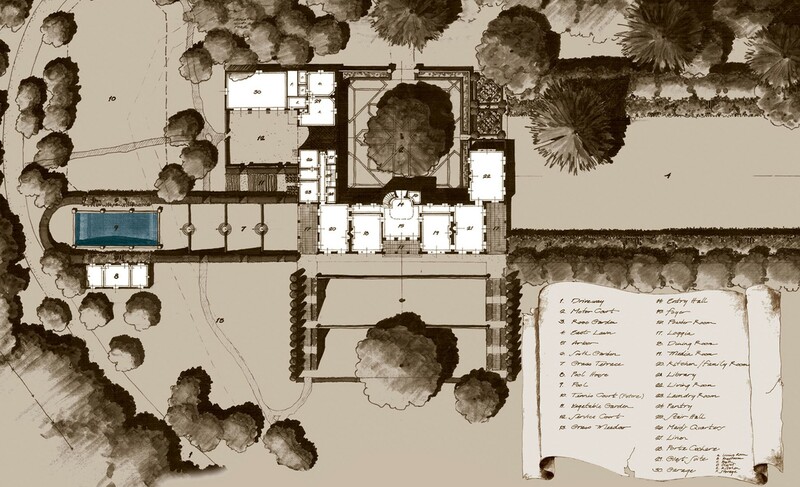 This drawing was generated to help show the changes needed to fix the problems and create a proper entry to a grand estate. - An international buyer was looking at a 400acre vineyard but was interested in what might be possible on the parcel prior to closing the deal. 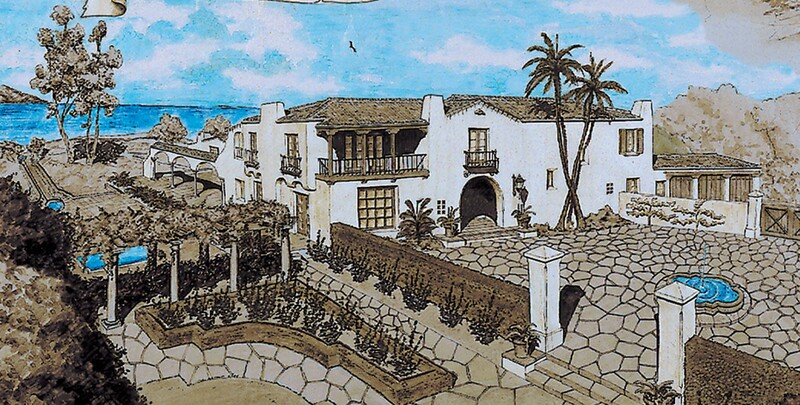 This drawing gave the buyer the visualization needed. The property was purchased. 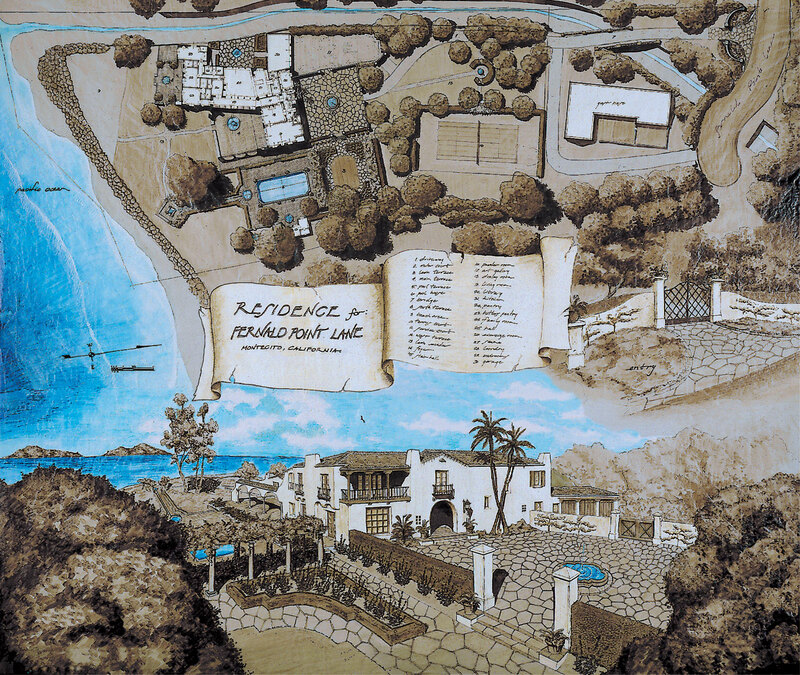 - This Rendering was completed for use by a listing Agent for Print Collateral and Brochure. 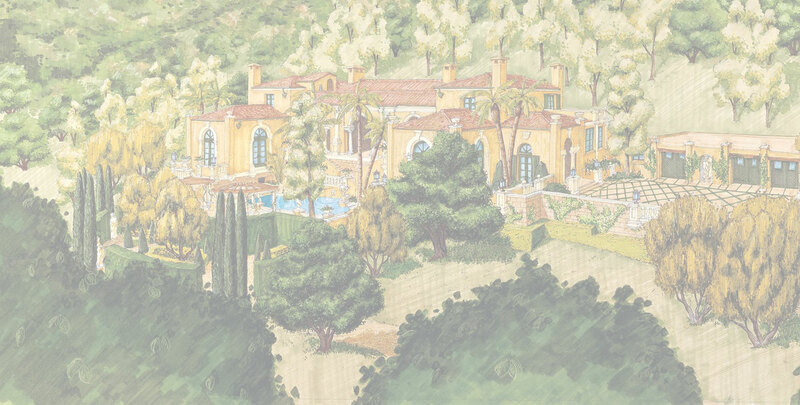 This depicted a design for a grand estate on a very steep hillside.